Section 2.0 GREENBELT PLAN is amended by adding the words “and as Urban River Valley” after the words “Protected Countryside” in the first paragraph. Section 2.4 Lands within the Protected Countryside Area is amended by adding the text “, except section 6.0” after the words “Greenbelt Plan”. Section 5.5.3 Schedules and Appendices is amended by adding the text “, the Urban River Valley Area” after the words “Oak Ridges Moraine Area” in number 1. Key river valleys in urban areas adjacent to the Greenbelt provide opportunities for additional connections to help expand and integrate the Greenbelt and its systems into the broader Southern Ontario landscape. The Urban River Valley designation provides direction to those areas where the Greenbelt occupies river valleys in an urban context. These urban river valleys may be the setting for a network of uses and facilities including recreational, cultural and tourist amenities and infrastructure, which are needed to support urban areas. space, recreation, conservation and environmental protection. 6.2.1 The lands are governed by the applicable municipal official plan policies provided they have regard to the objectives of the Greenbelt Plan. similar approval, is permitted provided it supports the needs of adjacent urban areas or serves the significant growth and economic development expected in southern Ontario and supports the goals and objectives of the Greenbelt Plan. 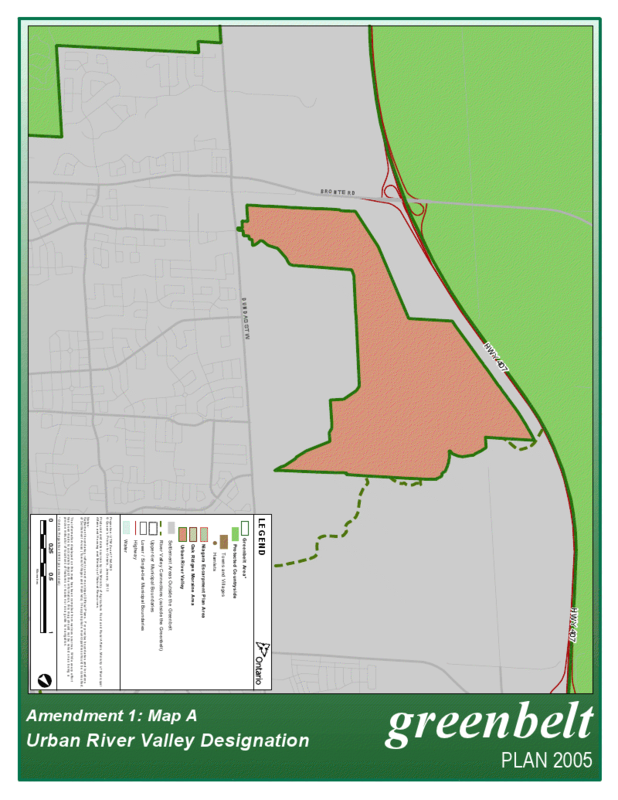 Schedule 1 of the Greenbelt Plan is amended consistent with the attached Map A by designating the lands described in paragraph 4 of Ontario Regulation 59/05, as amended, as Urban River Valley, showing those lands within the Greenbelt Area and making necessary modifications to the legend. Schedule 4 of the Greenbelt Plan is amended consistent with the attached Map A by showing the lands described in paragraph 4 of Ontario Regulation 59/05, as amended, as being designated as Urban River Valley and within the Greenbelt Area, and making necessary modifications to the legend. Appendix I of the Greenbelt Plan is amended consistent with the attached Map A by showing the lands described in paragraph 4 of Ontario Regulation 59/05, as amended, as being designated as Urban River Valley and within the Greenbelt Area, and making necessary modifications to the legend. Appendix II of the Greenbelt Plan is amended consistent with the attached Map A by showing the lands described in paragraph 4 of Ontario Regulation 59/05, as amended, as being designated as Urban River Valley and within the Greenbelt Area, and making necessary modifications to the legend. The Table of Contents is amended by deleting the title “1.2.2 Goals” and replacing with “1.2.2 Protected Countryside Goals”, and by adding the new section titles of “1.2.3 Urban River Valley Goals”, “2.5 Lands within the Urban River Valley Area” and “6.0 URBAN RIVER VALLEY POLICIES” in the appropriate places.